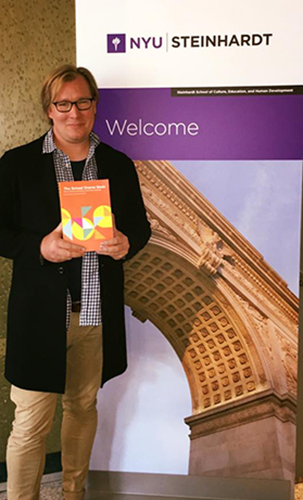 Our Education Manager John Saunders is just back from New York, where he launched The School Drama Book at New York University (NYU). Having developed a relationship with NYU and their theatre education department, John was asked to launch the book at a conference there by Associate Professor of Educational Theatre Dr Philip Taylor. John says the international exposure for the program is a significant step..
“Profiling our work on an international stage is really important. We already take our theatre work abroad and it's great to be taking our education work abroad too,” he said. The book was developed together with The University of Sydney’s Professor Robyn Ewing, following requests from teachers who had engaged with the School Drama program and wanted more information on how to continue with the pedagogy. “Robyn and I wrote the book for Primary Teachers specifically, as a resource we could direct them to for more information,” John said. “I think it's rare for a theatre company to be involved in publishing a book about drama education, particularly in primary schools. Actually, I don't know of any other company that has done that,” he said. 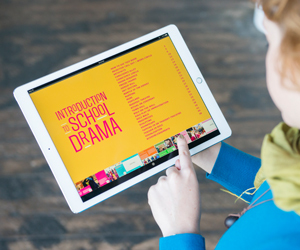 Along with The School Drama Book, John worked with Apple in creating The School Drama Book Companion, a multi-touch app that contains the drama strategies detailed in the book along with images and videos that showcase how the strategies can be set up in a classroom setting. John says the companion is a great tool for teachers who would like to utilise the School Drama pedagogy but wouldn’t necessarily have access to the regular face-to-face nature of the program. “It’s one thing to read about the School Drama strategies and devices, but it’s another thing when you can see it in action – which is the great thing about the Companion app,” he said.